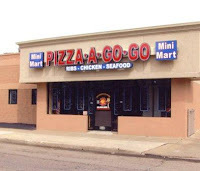 One of the great stories that I missed when my life got in the way of blogging is the opening of Pizza A Go-Go. Pizza A Go-Go opened at the southeast corner of Evergreen and Paul (6540 Evergreen Rd.). They have good traditional pizza, plus a variety of other hot food menu items (e.g., burgers, chicken, shrimp, subs, and ribs) as well as a limited selection of other grocery items at very reasonable prices. The owners, Craig Deland and Sal Ambrosio, hope that the new business will help the Warrendale neighborhood. I wish them well and will have more on this new restaurant next week. That's my beloved Sal formerly of my beloved Pizza America in Abilene Tx. Heard he was opening up something in Michigan. This just might give me a reason to visit Detroit. No offense, but probably the only reason I'd go o Detroit. If you go yourself tell him Andy says hi.